Today I started gathering my thoughts so that I may summarise my first six months of flailing away at a million words. In particular, I've been looking through my work in progress folders, which are a bit of a misnomer -- this is where work has stalled, and many of these documents will never be recommissioned. What these wasted raw materials reveal, when read en mass, is how much my reading influences my writing. The effect is more pronounced this year, as I often sit down in front of a blank dodcument and think, "Okay, I just need to write 1,000 words in the next 45 minutes." And so I write. Without a key idea or a first sentence or a big moral in mind. Half of these sessions are fruitless (though they are not pointless; the act of writing fast everyday means the joints are oiled for those days when there is a fire in my belly and I have something smart/funny/important to write about). The other half of these sessions will bear fruit -- perhaps it is a line that will be excised and start it's own story. Perhaps it is an image that belongs elsewhere. Perhaps it is a character or the voice of the narrator that I want to spend more time with. But what the fruitless and fruitful sessions share is that they are not shy about wearing their influences on their sleeves. When I was in the midst of Kurt Vonnegut back in April (books read: God Bless You Mr Rosewater, Breakfast of Champions, Cat's Cradle) I opened up a file one evening and began a piss take of my own serious, literary novel (that is: Novel B). Re-reading the two pages I knocked out of Faucets of Wonder, the Vonnegut influence is clear. Preface, Intrusive narrator, irreverence... it's all so transparent. If I were to return to this document again this year (which I might, I'd say the odds are 3/1), I'd scythe away most of the Vonneguttian aspects, and focus on the story behind the narrative fireworks. But the thing is, without the fireworks, without the bank of reading behind my imitation, all I would have is a blank page. The process of writing, for me at least, is a process of constantly overstepping the mark, of over-imitating. It is only when you transgress, when you push the story too far, that you learn anything about writing. This is why reading is such a vital part of a writing life -- you need those other voices to rattle around in your head, those imagined lives to sit across the table from you, to push you towards a vision and a voice that is truly yours. Aside from my fiction, I should be able to look back on this blog and trace my reading life as I can my writing life -- the two being so entwined. And I have, from time to time, thrown words at the books (and audiobooks) I have consumed. But I must confess I haven't been as assiduous as I would have liked (now that I'm trying to don my historian hat). What did I think of Never Let Me Go? Why did I not finish reading Waverly? I can provide rough answers now, but the steam has gone out of these experiences - what I write would tell me more about what I'm reading/listening to now, and my own fictions I'm working on, than what I was doing at the time. So I shall endeavour to say more about reading on this blog in the next six months -- not because I think I have much to add in the way of literary criticism, but because it is, undeniably, a part of the year of a million words (Misnomer #2). And even though it's still technically the first half of 2008, I'm going to get my resolution off to a running start. 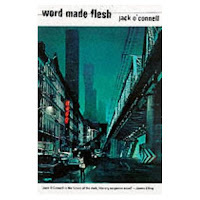 Today at lunch I finished Jack O'Connell's 'Word Made Flesh'. The cover blurb from James Ellroy proclaims O'Connell is "the future of the dark, literary suspense novel." I would never read a book on the basis of its blurb (I sought out 'World Made Flesh' on the basis of a recommendation somewhere online), but this particular one says more than it seems. Yes, this book is dark and at times literary (if being about books and language makes something literary), though I didn't ever find it suspenseful. But that's okay because Ellroy says O'Connell is the future of the dark, literary suspense novel - he doesn't say this is the novel. Which is like saying, "I think David Smith will be an All Black one day." This sense of as yet unrealised potential typifies my reaction to 'Word Made Flesh'. The story frequently gets bogged down in scenes which build up his fictional New England city of Quinsigamond and its underbelly but don't actually move the story on in any meaningful way. It often feels like the crime fiction aspects have been learnt by rote, and although O'Connell is doing everything in his power to up the ante (more violence, more corruption, still more violence) he hasn't yet transcended the straightjacket of genre. I’m hanging out for the second instalment in Carl Shuker’s Three Novellas For A Novel (available to download for “Free Or More”). The first novella, ‘The Depleted Forest’, isn’t an easy read, but Shuker’s work never is. Think Pynchon or David Foster Wallace or William Gass. But as with these writers, the rewards are there for those who persevere, or just let go and let the prose and the mysteries of scientific advances in concrete and machine translations of Japanese texts wash over you. Then there’s Brave New World, Cymbeline, and Sport 36… which all deserve comment but I’ve done my dash tonight. This is, after all, the first day of my resolution.